CELLO LESSONS for adults and adolescents by all-round musician and teacher Wouter Mijnders. Are you a beginner, have you been playing for some time or are you about to start up again? Besides sharing enthusiasm for your instrument of choice and the wonderful repertoire the cello encompasses, Wouter will challenge you to discover and develop your skills, talents and musicality! 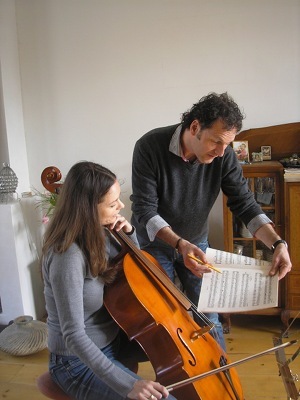 Wouter has over 30 years experience in giving cello lessons to individuals and ensembles, both adults and youngsters. Enjoy a nice CAPPUCCINO or ESPRESSO while taking a lesson! See vivaldimusiclessons for tuition fees.